Storey Publishing, LLC, 9781603425766, 352pp. Krystina Castella is a professor at the Art Center College of Design in Pasadena, California. She is the author of A World of Cake, Pops!, Crazy About Cupcakes, and Discovering Nature’s Alphabet, and she has been published in Craft magazine. If Epicurious.com ever decided to do a cake-version of "Around the World in 80 Dishes," Krystina Castella's A World of Cake (Storey) would be a good book to have on hand. Truly global in her coverage, Castella's book is a great resource for anyone with a sweet tooth and particularly, a penchant for cakes. The introductory chapter includes a year's worth of cake-appropriate holidays (October 2 for Gandhi's birthday; late May/early June for Lazybones Day in the Netherlands). My favorite part of the introduction is where Castella discusses cake categories: Chiffons, doughnuts, honey cakes, rice cakes, and more all have their place in the larger cake family. With 150 cake recipes showcased by region, there are some that are definitely familiar: King Cake, Black Forest Cake, Panettone, Mochi. And then there are the unfamiliar, and that's when things get really exciting. Malpuas from India, Nutmeg Cake from Armenia, Bolognese Rice Cake from Italy, Simnel from Ireland—the list goes on and on. Options for fillings, icings, and other flavors are presented with each recipe and interesting factoids about the specific recipe help put the cake in context. So if cakes have a special place in your heart and on your palate, you'll appreciate Castella's passion and knowledge about cakes and its world wide appeal.
. . . a well researched, thoughtfully organized, almost documentary-like survey of cakes around the world by someone who has written several dessert books (Booze Cakes, Crazy About Cupcakes), perhaps best politely described as whimsical, was exactly -- but then again not quite -- what we expected. But this is a good book, a great one, even. "...this book is a distinctive contribution to the world of baking, and armchair bakers will delight in flipping through the pages of this colorful and engaging volume." Chosen as Best International Baking Book in the lineup of the twenty five Best Cookbooks of 2010! "Pictures of marzipan-covered fruitcakes are gorgeous, and sidebars on such topics as street cakes make this an educational book in addition to a holiday workhorse." 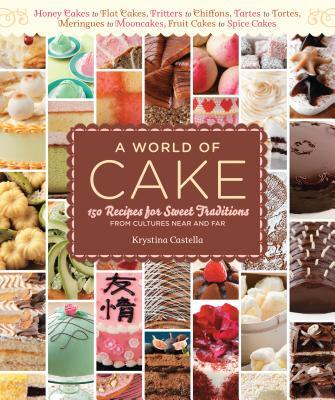 "This extraordinary new cake book by Krystina Castella is a perfect gift for anyone who loves cake even if he or she doesn't plan ever to bake one. It is an in depth study of myriad cakes from all around the world. It is fascinating to see how each cake, beautifully photographed in color, reflects the history, ingredients, and technology of its culture. As a cake baker I love seeing the world through cake colored eyes.I feel somewhat remiss that my emphasis over the years has been focused mainly on flavor, texture, and personal history and less on the wider historical origins of my creations. This well-researched book will serve as a handy reference guide. It takes cakes to a whole new level of significance and presents them, both visually and historically within the context of their creation."